Hänel proudly holds the title of the first manufacturer in Europe to produce carousels based on the cutting edge Ferris wheel principle. Today, Rotomat carousels are exported worldwide helping all business sectors achieve their storage potential through automated systems. The Rotomat carousel is a future-proof, flexible storage and retrieval system that adapts optimally to your needs whilst integrating unobtrusively into your workplace. Similar to the Lean-Lift, the Hänel Rotomat can hold a high volume of goods on a small footprint. Distinctively, the Rotomat is best for holding small components and a range of different sized tools where all items can be secured in containers on shelves and returned quickly and safely once requested by the operator. The unique advantage of the Hänel Rotomat is the ability to adapt the shelves to suit the size and weight of your held items. There’s no need to store only a small selection of your items but all of your intricate components and parts can be protected and stored away neatly. To meet the ever growing demands of a modern day warehouse, a simple, controlled and efficient logistics process can be implemented by introducing the Rotomat. This vertical carousel, together with its short travel paths and swift retrievals, enables superb order-picking performance for all your staff. For larger warehouses, staff can select and fill orders at multiple Rotomats continuously and can be positioned in working groups. Whether it’s handling complete sub-assemblies, bulky components or valuable tools, the Rotomat storage carousel is an adaptable solution suited to numerous departments across sectors. At Industore, our project managers will find out exactly what you’ll be storing and will customise the interior fittings of the machine accordingly. From multiple shelves with slotted holes and movable dividers, to trays with adjustable front walls, you’ll recieve a truly custom-made solution for your individual demands. The size and weight of your stored goods will determine the mechanical parts and carrier sets for the shelves and will be adapted effortlessly to your future needs and growing product range, whilst still achieving maximum efficiency of total storage volume. guarantees a more robust performance with discreet retrievals. moves the shelves towards the access area super efficiently. This special motor design provides you with further benefits by ensuring optimal balance if the stored items loaded on the shelf are distributed unevenly. The ergonomic work counter enables users to pick, put and slide storage containers with ease. The work counter for picking and returning stored items in the Rotomat is extremely durable. The LED display integrates elegantly into the work counter as an indicator of each storage compartment, ensuring error-free retrieval. Behind this counter is the Hänel safety threshold which allows correct level access to the goods whilst ensuring overall protection. For businesses needing to protect high valuable tools, components and stock, the Rotomat is fitted with a lockable sliding door which protects all goods from dust, dirt and theft. The sliding door is split into upper and lower halves which makes the door easy to open by staff only. There is no need to secure the door with any other additional counter-weights. This feature is particularly favoured amongst the aerospace, defence and healthcare sectors. With a partnership based on trust and high quality service, you can have peace of mind in knowing this innovative machine, from one of the best manufacturing sites, will work reliably and will serve you for a number of years to come. If in a rare occurrence, a malfunction should arise with the Rotomat, the unique Safety Bypass system comes swiftly into effect, providing you with complete assurance over safety in your workplace. For example, if a light barrier curtain or door switch is momentarily dysfunctional, the user can activate the Safety Bypass system and continue to access goods until your local service team arrives. If your business needs to store goods in a cool, dry or protected environment, look no further than the Hänel Rotomat from Industore. Across a broad range of sectors, many products today need to be stored under very specific, controlled conditions. From highly sensitive components in the electronics industry to fragile substances and medicine supplies in the healthcare sector, we understand that the ever expanding quality requirements companies need to reach are becoming increasingly stringent. Or choose a mixture of all three systems for the perfect storage environment for all your stored goods. If you need to protect your stored items from any corrosion, the DryStore will be the best solution for your business as you will get a guaranteed safety shield from any rust, dirt or decay, with a constant 5% humidity. This principle is based on a robust double-wall technology combined with filter systems to maintain impeccable conditions for your items. This is proven very popular in sectors where high levels of air cleanliness is necessary for production, such as in semi-conductor or medical engineering. 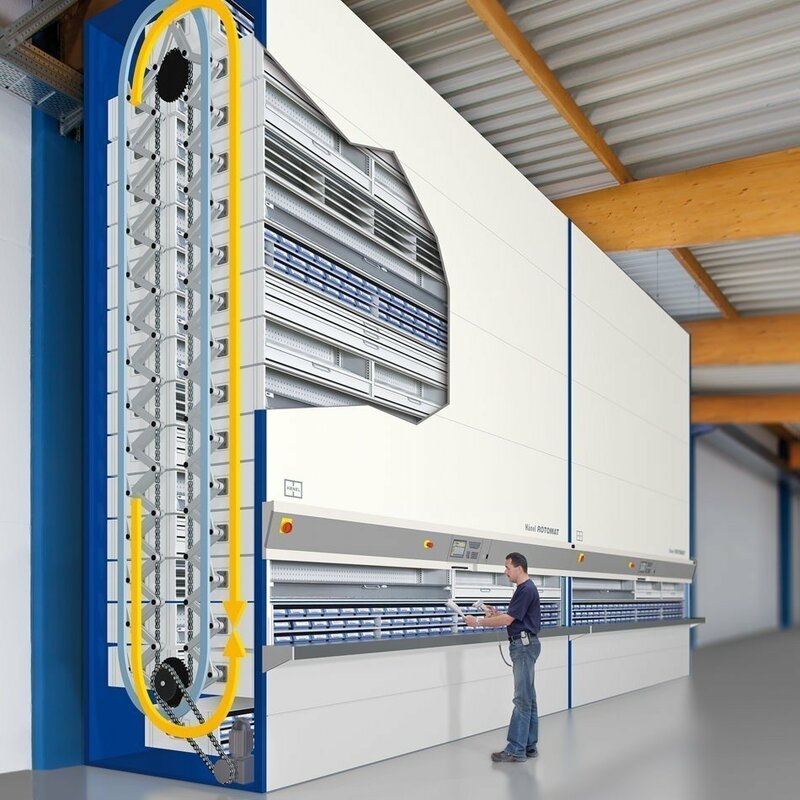 With this solution, goods will be stored in units at a constant controlled temperature, either as cold stores or heated systems for drying components. Temperatures for the Rotomat range from –20°C to +60° C, illustrating how limitless your storage options can be thanks to this future-proof technology. The Rotomat isn't just for industry, they’re also extremely popular in offices throughout the UK and Ireland. Its compact design enables more space for archiving documents and you’ll have an enviable filing capacity. This multifunctional machine will mean your expensive office space can be utilised more effectively, without having cupboards jam-packed with all those files you need to hold on to for years and years. Find out more about the Rotomat for office and what it could do for you by clicking here.